There is a really weird thing about my dad. No, no – hear me out. I don’t mean weird like weird. Actually though, if you think about it we all have our own variety of weirdness, do we not? Oh, we do. We are who we are and we think that anyone who isn’t like us is weird. News flash: We are all weird. Weirdo. And when it comes to strawberries? I can’t even believe I’m related to him because he will not touch a strawberry. He says it’s the seeds. Oh but he is missing out on one of the finest pleasures of this life on earth. What?!? He won’t eat a fresh strawberry, a peach off a tree, or about fifty other fruit and vegetable options – but he’ll eat a beet? So weird. I don’t even like beets. I think they taste like dirt. (Not that I’ve actually eaten dirt.) I’ve tried but I just can’t like them. See, and this makes me weird to those of you who do like beets. I told you we are all weird. Since my dad won’t eat strawberries, I will continue to eat his share and my share plus all the other strawberries I can get my hands on. They are my favorite. 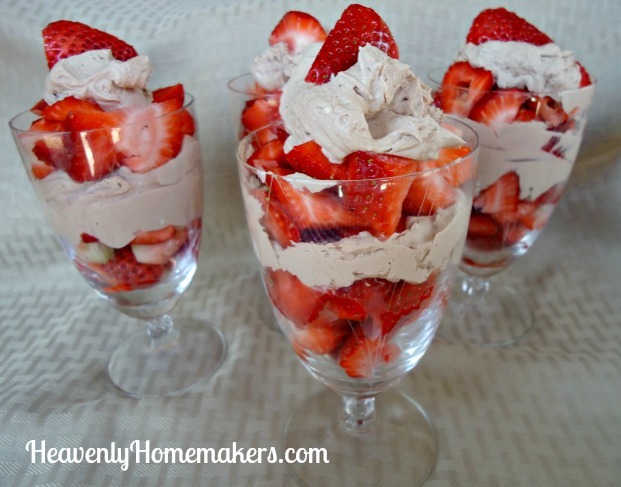 Our family recently combined two of our favorite recipe ideas: Low Sugar Strawberry Cheesecake Parfaits with Chocolate Whipped Cream. 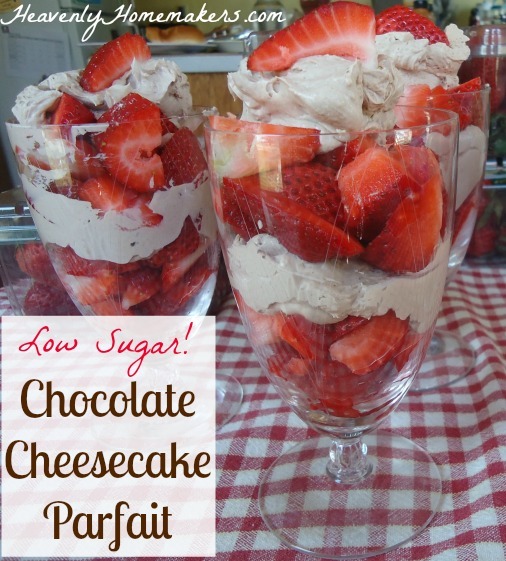 The result is a delicious Chocolate Cheesecake Parfait. Of course, I used strawberries with the chocolate cheesecake to make these. But you could use blueberries, bananas, and whatever other fruit you might like. Place all ingredients (minus the strawberries) into a blender. Spoon mixture into bowls or cups – layering them with sliced strawberries. If you have a tried and true you will like beets if you eat them this way recipe, please do let me know. Otherwise, I’ll stick with the other dozens of fruit and vegetable options I do like and I’ll eat strawberries like there’s no tomorrow. Never forget that you’re weird and I’m weird and everyone is weird. I love pickled beets. I grow and can my own. They are good with pinto beans and corn bread or just by themselves as a side dish. Laura, I am totally with you on the beets. The taste like DIRT. One summer, we participated in a CSA….so many beets! I tried all kinds of recipes, including pickling, which I usually love (pickled cauliflower – yum!). Nope. I don’t care if I never see another beet in my lifetime. I will gladly eat many other veggies. I did make a beet and cabbage Asian slaw that was good, but I didn’t save the recipe. So if you find yourself with some beets, that could be an option. I love strawberries! Yesterday, I was in a coffee shop, and saw that they had strawberry cream muffins. I almost got one, but then I remembered your recipe and decided to make some instead. First of all, wash the beets. They grow in dirt and unless all that dirt is scrubbed off, they will, unfortunately, taste like dirt. Third, try peeling them (again wearing gloves!) and juicing them along with some apples and kale. Yummy. But again, I repeat: SCRUB the beets! And if after all that, you still don’t like them, relax. I can’t stomach okra or collard greens. But I like almost all other veggies. Laura, why knocking beets? I LOVE beets. I never ate them growing up (my parents didn’t like them), but man, once I tried them at probably age 26, spring has changed. YUM. They’re not at our stores yet, but I am SO looking forward to it. MMM, roasted beets. On a salad. Or just on a plate. My parents also didn’t like asparagus, so I never tried that growing up either. Good thing my husband introduced me to it! Don’t worry, my parents did like other fruits and veggies – green beans, tomatoes (oh gosh homegrown tomatoes – my dad wins the taste test every year at the tomato fair), eggplant, squash, zucchini, brussels sprouts (I used to get my granddad’s share, too), peaches, apples, perfectly steamed broccoli (which I have yet to perfect, so I just eat it raw or roasted), cauliflower….. And I still eat most of those. I like your writings 99.9%, but this one is in the .1%. To me, weird is such a harsh word. It gives me negative vibes. I use the word unique instead. I think it is much more positive. God did not make us weird, He made us unique. And isn’t it great that we are all unique? Aww, I’m sorry to come across that way. :) You’re right – weird can be a harsh word. I was just being silly. Unique is a better way to describe us all – I just like appreciating the weirdness sometimes (all in fun!). I have a recipe using beets that I think you will love. It is Chocolate Beet Cake. I got it from the Green Smoothie Girl. Puree cooked beets in high-power blender, then add eggs, sugar, oil, and vanilla. Add chocolate and remaining ingredients. Bake in a 9 X 13″ for greased pan at 350 for 30 minutes. Once cooled frost with chocolate frosting and enjoy! Having taste buds is another gift from our awesome God! Have a wonderfully amazing day as you bless those around you with unconditional love! I love your comments Laura…..and I love beets too like many of your readers….they are good in a salad, or with a sandwich….. I was wondering about the beet cake Tina makes…..wonder if you could use beets in a red velvet cake instead of a whole bottle of red food coloring which sure isn’t good for you….I like the red velvet cake, but eat it rarely…..because of all the food coloring…..would you or your readers know ??? Would love to know…. Try beets in a salad Laura and see if you like them …..
Now I will comment on your Dad being weird …..so am I, I do not like Strawberries at all, and it isn’t the seeds, they are sour…..I’d rather have the frozen ones packed in sugar if I do them…..now that is weird….my daughter loves them….she just bought a flat from a school kid and she brought a basket to me…..washed and had 2 this morn….all I could do to eat them, but of course I did put sugar on them …. I do like fresh peaches, but don’t like to peel them…..the fuzz on the peach makes me chill…..I prefer canned peaches in their own juice, not sugar added….but I also am not a lover of fruit…..I’d rather have a hershey or reese cup :) anytime…..or lays potato chips……instead of any fruit…..can’t stand bananas, but manage to eat a half one with yogurt every day for the potassium of course….otherwise I’d never eat one……I do like a pear occasionally ……oranges in season and sweet of course….. don’t care for grapes…..or apples…..so you see I am weird too, and my daughter would tell you so……sending this email to her, she will get a kick out of reading it….and she will say yep, your Dad sounds like my mom….. I really enjoy beets and don’t think they taste like dirt at all. Not that I’ve eaten dirt…well, not on purpose, anyway. I suppose anyone who’s had their own garden has ingested a little good, clean dirt. My grandmother used to say that everyone eats a bushel of dirt before they die…..but back to beets. Too bad you haven’t found a way to like them, because they are so healthy! The chocolate beet cake recipe sounds like a good thought for non-beet-lovers. And the greens are nutritious and yummy also! And worse case scenario, you can use (or freeze) the greens to put into a tasty smoothie! As far as strawberries go, I agree that they are a little piece of heaven on earth! Both my husband and I grew up with strawberry gardens, so we’re forever spoiled by experiencing them in their freshest and most delicious form (sometimes accompanied by a little dirt! ).